Holiday Mantel Decor – Alive With Color! 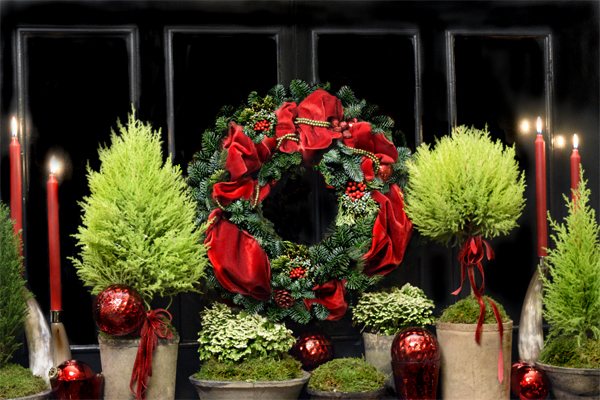 | Faddegon's Nursery, Inc.
Holiday Mantel Decor – Alive With Color! This year we’re celebrating the season with living decorations on our mantel. Simple and natural, lime-green lemon cypress trees give the perfect small tree effect, along with the soft under-story of Frosty Ferns. Lemon cypress trees work well with any background, dark or light! Coordinate your containers to pull the look together. Natural elements lend themselves to any theme or taste you can think of! Here, we have red and white taking center stage, beautifully highlighting poinsettias and lemon cypress trees. Festive, fun and fresh at the same time! Fill in spaces with small objects that depict the season. Small bottle-brush or ceramic trees, extra ornaments laying about, and votives to match will tie-in the whole look. You can even add greens sprigs in clear vases if you want to focus on botanical inspiration. Of course, fresh evergreens are a perennial favorite. Don’t feel limited here. There are many to choose from, all with different textures and forms. It’s easy to get pops of color when you add some winterberry, juniper or incense cedar.